LF Driver Size: 8" 8" 8"
HF Driver Size: 1" 1" 1"
Weight: 22.5 lbs. 26.5 lbs. 23 lbs. 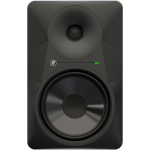 The Yamaha HS8 is easily one of the most balanced mid-range monitors on the market. The full range response is extremely clear and unforgiving. The HS8 delivers uncolored sound that is perfectly reproduction of the project that you're working on. The only downside to these monitors is that you'll be paying a higher price. However, the quality of the sound makes up for the price difference if you're serious about quality monitors. The KRK ROKIT series first came to fame in the early 2010s. 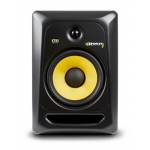 Their signature black and yellow design drew producers to the sleek monitors. The benefits of the KRK ROKIT 8 are the affordable price and solid build. Unlike the previous generations of the KRK ROKIT which only reached 49Hz, the third generation features a full range of sound that reaches all the way down to 35Hz. While the KRK ROKIT is a good value, the balance is very sub-heavy. The low end is very clear and not muddied up, but the tweeter is relatively under-powered when paired with the 75W woofer. Reference tracks will be your friend when working with these monitors, so you can get your levels right. Mackie was one of the late comers to the studio monitor game, but have quickly caught up to their best competitors. Although the MR824 aren't the loudest monitors on the list, they're perfectly balanced and deliver a flat and clear response. The Mackie MR824 is easily the best value when comparing quality to price. The downside of the MR824 is the low power of the speaker. Fortunately, most users won't be maxing out the volume of the speakers anyway. If you are thinking about using your speakers for casual listening or using them at house parites as PA speakers, then you should considers looking elsewhere. The first choice is the unrivaled Yamaha HS8's. The crystal clear response make it great for sound design, mixing, and mastering. 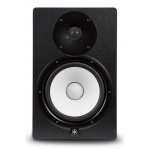 If you're on a budget and don't plan on using the monitors for casual listening, the Mackie MR824 is a great runner up.